"We are always indebted to you, Dr. 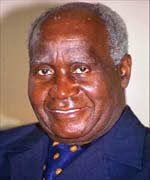 Kaunda...It is the visionary African Statesman that invited the African National Congress and other liberation movements to settle here in Zambia when it was not fashionable to do so. For Dr. Kaunda, it was just the right thing to do. For that, he and Zambia paid a heavy price for the more than three decades of support, solidarity and compassion. He was the driving force behind the expulsion of South Africa from the Commonwealth because of apartheid...thi s testified to the character of Dr. Kaunda to peace and freedom. The African Union...will on May 25 this year be celebrating 50 years. You will agree with me that there is no better human being, no better African that embodies the values of our continental body." - South African High Commissioner to Zambia Kgoshi Piet-Mathebe speaking at Mulungushi International Conference Hall at an RSA organized event to celebrate Dr. Kaunda's 89th birthday. 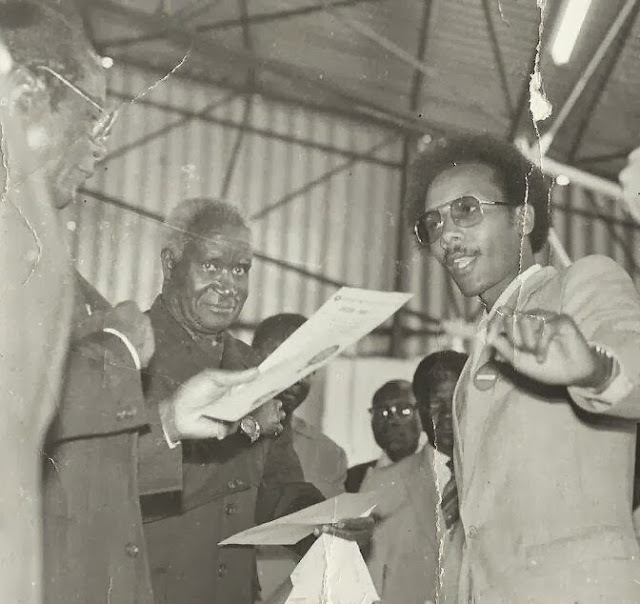 The Police and Prisons Civil Rights Union (POPCRU) honored the President Kaunda for his role in the liberation of various countries in the region, including South Africa. Present were COSATU President Dlamini, POPCRU president Zizamele Cebekhulu and SA Communist Party executive member Charles Setsubi. Photo: Me with President Kaunda and Zimbabwean President Robert Mugabe.